Duchess Potatoes like Gail’s (click over they’re gorgeous!) 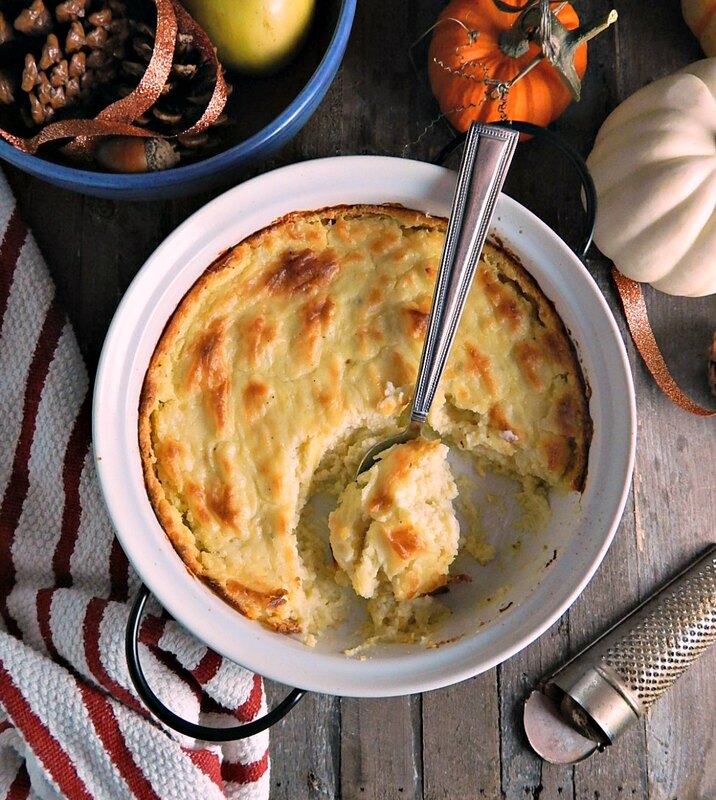 are the epitome of good taste and smack of dinner parties, and Duchess Potatoes simply transform a mashed potato into a thing of beauty. There’s usually a little cream involved, a few egg yolks and oh, please don’t forget the cheese! And while every mashed potato might not be a good contender to pipe out for the traditional Duchess Potatoes (maybe, especially, if they’re too creamy) this Duchess Potatoes Casserole (From Leftover Mashed Potatoes) is just the perfect thing for just about any mash. But first, I had to find out if there was a “formula” a kind of ratio to use between the potatoes, egg yolks, and cheese that was going to be a perfect texture for a casserole. I looked at a few recipes (starting with Gail’s, of course, and thank you, Gail, for the inspiration!) and I think I cracked a code. It seems like about an egg yolk for each one and a half cups of mashed potato, an ounce of cheese (if your potatoes don’t already have cheese; I thought my potatoes had plenty with all the cream cheese) and a little milk or cream if you have it is even better (if needed, just enough to make them creamy enough to stir but not enough to make them “wet”) will do the trick. There’s really a bit of a judgment call in any of the milk or cream you might add to your mashed potatoes because everyone’s mashed are a little different. Some are only made with milk and butter, other’s like my Slow Cooker or Oven Make Ahead Mashed Potatoes might have sour cream and creamed cheese. And still, others, like Gail’s Havarti Mashed Potatoes might already have cheese in them. Heck, this recipe will even work with “loaded” mashed potatoes complete with sour cream, cheese, and bacon. The bottom line, though, it really doesn’t matter because your Duchess Potatoes Casserole (From Leftover Mashed Potatoes) are going to be delicious no matter what. It’s kind of like making Traditional Irish Potato Cakes, another great use for leftover potatoes. You’ve got to allow for a little “personality” shining through from your original mashed potatoes and accepting of the outcome. Has anyone noticed potatoes are getting pricier at the store? I’ve noticed that so many are now “name brand” and in smaller bags. And they do look prettier, all washed and uniform in size but you pay extra for that. Look to see if you can’t find larger, 10-pound bags of potatoes and pick them up. You can give them a sort yourself and use the larger, more uniform ones for bakers and the odd-sized shaped ones for recipes like this where size doesn’t matter. Potatoes that aren’t well-washed store better anyway, and you’ll want to store them in a dark place, a paper bag works well, away from onions. So watch for sales, especially during pre-Holiday and Holiday weeks, like Thanksgiving and Christmas for great prices on butter and cream. Check Aldi and Costco, too. Their everyday prices are sometimes better than the grocery store sales prices. Cream keeps for weeks past it’s “buy by” date and butter freezes beautifully. Shop well for that cheese. Watch the grocery store specials and coupon deals; grocery store cheeses keep for weeks, unopened and can be frozen. Buy it when it’s cheap and use it as needed. Grocery store cheese has become very competitive with so many newer brands along with the store brands. You’ll likely find specials all through the holiday season. Be sure to check my post on what to watch for on sale over the Thanksgiving, Christmas and New Year’s holiday sales and stock up at a low on many items. And don’t forget about your two extra egg whites. I have a ton of ideas and instructions on how to freeze on my post Over 75 Ways to Use Leftover Egg Whites. Scale recipe up or down as needed. Just watch the timing if using a small casserole. if desired, one or two scrapings from a nutmeg or the faintest pinch of powdered nutmeg, or a little garlic powder may be added. Mix together mashed potatoes and egg yolk. Add enough cream or milk to thin a bit if needed; mixture should be able to be stirred. Add in a little nutmeg or garlic powder if desired. Scrape into well-buttered casserole. Place a few designs on top with the back of a spoon, swirling or shingling as desired.. Note: if mashed potatoes are very lean to start with, brush the top of the mashed potatoes after you’ve added the “design” with a little melted butter, about 2 teaspoons or so. I’ll be sharing Duchess Potatoes Casserole (From Leftover Mashed Potatoes) at Fiesta Friday #251 where this week I’m one of the co-hosts along with Monika @ Everyday Healthy Recipes. This entry was posted in Click here for Fabulous Food Posts and tagged Cheese, Cream, leftover mashed potatoes, Leftovers, mashed potatoes, Potatoes. Bookmark the permalink. Wow – save money and eat well! Thanks much, it’s a fun little redo! My mother used to make these all the time. She added cottage cheese and an egg, they were delicious. I also like them on top of a shepherd’s or cottage pie. I could make a meal of them. Have you ever read MFK Fisher? One of her secret private meals was mashed potatoes with ketchup. I love fried mashed potatoe patties which is probably not the healthiest but my grandma would make them for me on special occasions. She would take left over potatoes and flour and salt and pepper the patty. She would cook some bacon, drain off most of the grease, add some butter and fry potato patty. She would then make an egg in same pan and serve egg, bacon and potato patty on a plate. Didn’t have it often but so very good. I’m 70 now and still make this for me when I have left over mashed potatoes. It sounds a lot like the Irish Potato Cakes my Mom made, only better because of bacon! I bet you’re Irish, too, at least guessing from the name Joyce? It doesn’t sound like it’s done too much harm if you’re 70 and still cooking. 🙂 And on the internet! But like you said not, too often and moderation, right! Thanks for commenting, Joyce! If I could ever wrestle the leftover mash pot from my boyfriend this would be a great way to use them up! My son is the same way! 🙂 Basically he’d eat anything that didn’t move and was skinny, too! Mashed potato leftover casseroles are what I’m all about and your Duchess potatoes are looking mighty not leftover to me. But, potato pierogies fried in butter, now that’s some serious yum. Hey Mollie– love the specifics on your ingredients–makes it really clear. And these potatoes really look delicious! Certainly elevates mashed potatoes!! You are so smart! Love using leftovers too. Hope you had a lovely Thanksgiving. How did it turn out?? You can’t have too many Thanksgivings! We’ve already gone through the turkey leftovers– should I make another turkey??! And — I know who Kraig is– but who is Tweety (so cute!) ?? Hi, yes, Tweety is his g/f. She’s the kindest, sweetest person & has really become part of our little family! 🙂 lol on the Turkey!! Isn’t that darling! She’s been called that since she was a baby…I’d be hard pressed to remember her given name, lol!! I had a ton of leftover mashed potatoes. I am going to make these tonight! Hi Anne! I hope you liked them! I freeze my leftover mashed potatoes so rarely have any issues but this is an interesting new way to serve them. PS: I also have a baked potato puff (with choux paste) recipe that I want to try in the future … a twist on the regular fried Dauphine potatoes. I couldn’t get the video to come up! We had a lot of rain, too, but better than the snow we would have had if it were a few degrees colder! That’s a shame. Hopefully, the Food Wishes blog link will be better. Oh wow! I don’t know if I could eat one without thinking it should be custard or pastry cream inside, lol!!! Thanks! I always love a remake!